I never thought I'd look forward to a climbing up and around a mountain, but after about 100 miles of straight-as-an-arrow roads, it was great to have a change! Click on image to enlarge. 30 March 2011. Today was a relaxing day, though I did pedal 66 miles. I got a much earlier start than the day before: leaving around 7 am. After the straight-line Route 60 from Quartzsite, this section finally had a bit of a hill and some curves. I never imagined I would like a hill! As we rose (only about 600 feet), the vegetation became more interesting. Saguaro, hedgehog, barrel, and prickly-pear cactus, Ocotillo (is that a cactus? 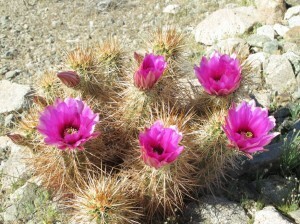 ), yucca (Joshua Tree), palo verde, mesquite. From my bike, I scanned Black Mountain hoping to spot a desert big-horn sheep, but no luck—and it would have required extraordinary luck. Taken by Dan, a fellow biker during a rest at a store on Route 60. Click on image to enlarge. 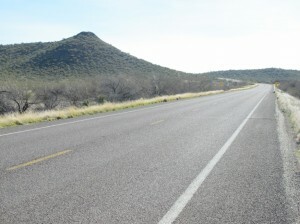 29 March 2011 (posted on the 30th from Wickenburg). 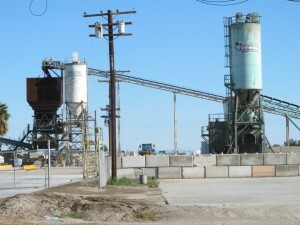 Aguila, Arizona is about as different from Quartzsite as you can get. It is extremely poor, run-down, depressing. The motel I’m staying in (Burro Jim’s) is even less expensive than my accommodations last night ($50—cash). It’s a vinyl flooring and BYOS sort of place (bring your own soap), but the shower works and I was able to scrape off the dust-infused sunblock that left my arms and legs gritty and sticky. I haven't identified this cactus yet, but it was growing along I-10 in the Dome Rock Mountains. Click on image to enlarge. 28 March 2011. Quartzsite, Arizona isn’t my model of an ideal town. It’s a town of truck stops, fast-food restaurants, and—apparently—it hosts the largest gathering of RV’ers in the world. Each January, 750,000 to one million people converge on the town, mostly in RVs, for a week of massive flea markets and whatever else RV’ers do. The town is also well known in the rock & mineral crowd, do to the rich geology here. (I’m okay with that!) Just last week there was apparently some huge show; this is clearly the town’s angle, and I guess they do it well. But all those people aren’t here right now—which is just fine with me! I arrived late afternoon, coasting down from the I-10 snaking corridor through the Dome Rock Mountains that lie between the Arizona border and here. After 84 miles yesterday, I took a more relaxed pace today, logging 49 miles (though my bicycle odometer/speedometer seems to crap out now and then—I’ll look down at it and see 0 mph, when I’m fairly certain that I’m going somewhat faster than that). Leaving El Centro. Note the Sea Level marker on the tank! Click on image to enlarge. 27 March 2011 (posted on 3/28 from a Starbucks in Blythe, CA). 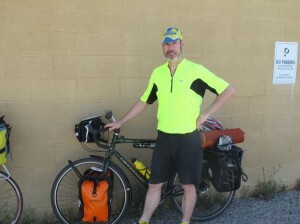 I started the day in El Centro and pedaled all the way to Palo Verde, which is about 25 miles south of Blythe, California, and just across the Colorado River from Arizona. El Centro seemed to go on forever—seeming far larger and spread out than its 38,000 population might suggest. I didn’t see the town center; I skirted it as I was heading for a route that Brian had suggested—much better bicycling. And, indeed, the old Route 111 was smooth with wide shoulders and virtually no traffic—cars and trucks choosing the new Route 111 that parallels it the whole way up to Route 78—about 15 or 16 miles. That would be the best pedaling all day by a long shot—at least relative to the safety and quality of the road surface. 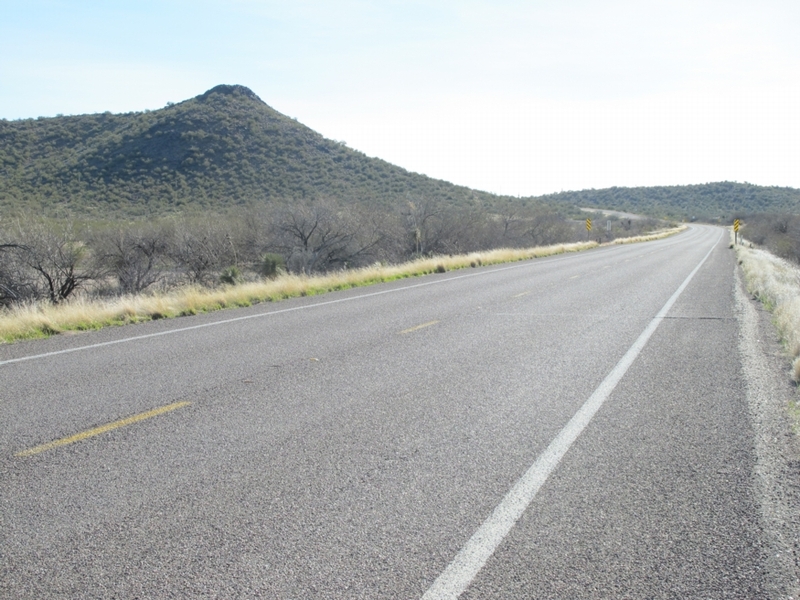 Route 78, which I pedaled on most of the day, and will take almost to Blythe tomorrow, started out fine, relative to the shoulder. Not a really wide shoulder, but wide enough. It was pretty bumpy, though. We have frost heaves in Vermont. Here, they have heat heaves I guess. About every 20 feet a jarring bounce. All packed up and out by 8:30--later than I had hoped. Click on image to enlarge. 26 March 2011. 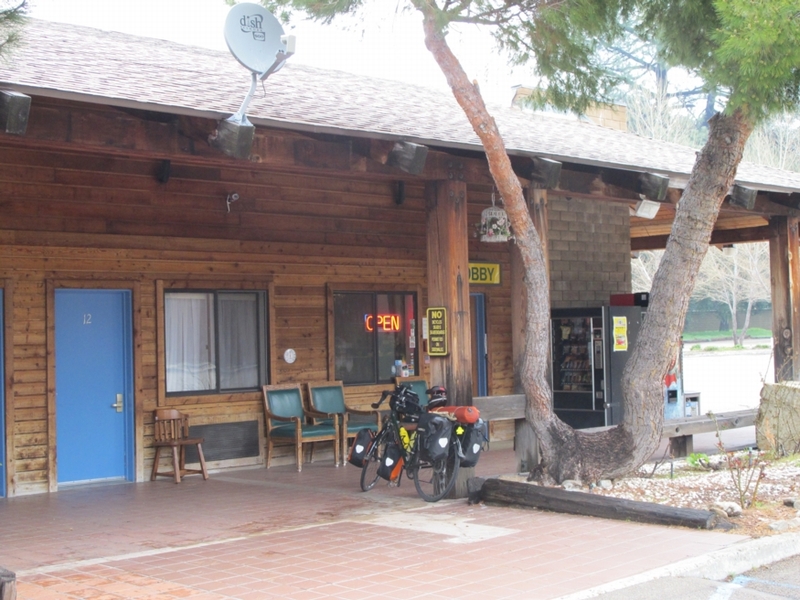 Before I get into today’s pedaling adventure, I have to relate a follow-up to yesterday’s story about my recovery from the cold at the Descanso Junction Restaurant—my salvation from poor planning. As soon as I turned out the light in my motel room last night (at the Pine Valley Inn and Motel) and began thinking over the day—a flow of mine that often keeps me from falling asleep quickly—I realized that I hadn’t hung up my yellow biking jersey to dry with all my other gear. Where was it? I turned on the light and looked through everything. It wasn’t there! After a bit of reflection, I realized that I had left it at the Descanso Junction Restaurant—perhaps my mind still addled by the cold. I had hung it up to dry on a hook on one side of my booth and my raincoat on another. Both dried nicely. I realized that I must have neglected to grab it after donning my other (warmer) clothes. I thought I was dressed all right for the day's uphill peddle, but that wasn't the case. Click on image to enlarge. 25 March 2011. It was gray when got up this in Alpine this morning. The forecast had indicated a chance of showers. It looked as if it had been gently misting. Following breakfast, a bit of time on my computer posting a blog from the previous day, and my adventures with the Post Office (see previous post), I was ready to head out. I was under the entry overhang coating my bike chain with this protective lubricant that the guy at the bike shop in Brattleboro said was the cat’s meow. I figured if I was going to be biking in a light drizzle, I should coat the chain first. The manager of the hotel came out and very kindly brought me a rag to use—and another to bring with me. Really nice guy. I think the hotel caters to bicyclists to some extent. When he saw me taking a photo of the bike, he offered to take one of me (first one here). 25 March 2011. The day started well at the Ayres Hotel in Alpine. I had been pleased to learn the night before that they serve breakfast. Lots of choices: waffles, French toast, bagels, fruit, yogurt, muffins, juice. You name it! I was looking forward to it—stoke up on carbs. When I went to the breakfast room, I was the only one there. I had decided on waffles and quickly spotted the hot waffle iron. But where was the waffle batter? I looked everywhere, then finally discovered a large dispenser—it looked more like a cappuccino machine of something. With clear signage, I was told to dispense batter into a plastic cup then pour it into the waffle iron (after spraying the waffle iron with some sort of aerosol grease—Pam, I guess). I skipped the Pam, and was pleased that the waffle didn’t stick. What struck me at this breakfast nook was the waste. Everything was throw-away: the plates (extruded polystyrene), the cups (HDPE), the utensils–everything. And I’m sure that the contents of that waffle batter dispenser goes into the trash as well after it has expired—or is the batter mixed somehow as you draw out your portion? Even the “syrup” (quotes intentional) was in little plastic packets. Welcome to our throw-away society! I realize that in the establishments I frequent back in the Green Mountain State I’m somehow shielded from this level of waste. It was striking. But that’s not the subject of this blog. 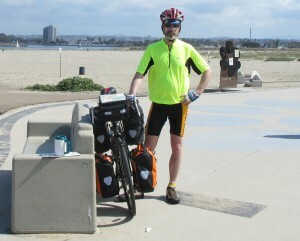 I rode about seven miles to this official starting point of the Southern Tier route at Ocean Beach Park. Click on image to enlarge. March 24, 2011. After posting the last blog (and struggling a bit with photos in my hotel room), getting breakfast around-the-corner from the Hotel La Pensione (a great place—and reasonably priced—in the Little Italy neighborhood of San Diego), and walking a lot farther than I expected to buy some sunscreen, I wheeled my laden bike (with at least 50 pounds of gear and water) to the elevator and down to the first floor. By the time I finished chatting with the proprietor and got on my bike, it was around 10:30 am. My plan was to start my journey at the Pacific ocean—Ocean Beach Park, which is the western terminus of Adventure Cycling’s Southern Tier bicycle route across the country. I don’t have any expectations of biking all the way across the country, but I wanted to enjoy the first five or six miles of that route, which is on a bicycle trail. So I biked the roughly seven miles there from the hotel—testing out the loaded bike for the first time. Quite the different performance with a lot of weight on the front! The above photo with me in it was taken by an obliging guy who was running his dog at Dog Beach (Adventure Cycling’s map instructions warn you about dogs here, but I didn’t have any trouble). My duffle is on the conveyor and the boxed bike about to be loaded. I spotted this as I was making my way to my seat. Click on photo to enlarge. I’m at 35,400 feet as I write this bog. Despite some anxiety on my part, my bicycle was boxed and ready to go at Burrows Specialized Sports this morning. I bought the last few items on my list (the last being some over-booties for my bike shoes—after checking the weather where I’ll be biking the next few days). I managed to keep the canvas duffle bag holding my four loaded panniers, tent, and assorted parts removed from my bike, to 48.5 pounds—just under the limit at JetBlue. And I was able to check in all right (I had a lingering concern that I needed to call in advance to let the airline I was traveling with a bike). 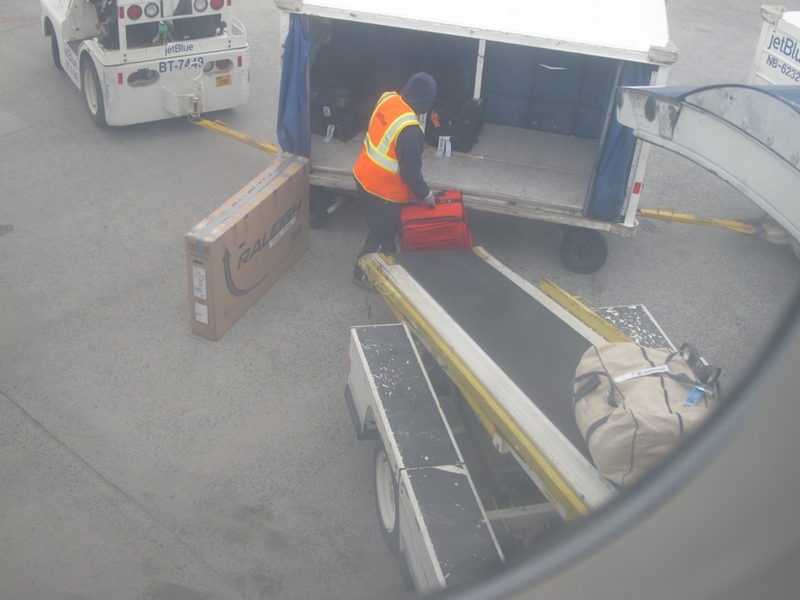 As evidenced by the photo posted with this blog (taken from a window on the plane as I was making my way to my seat in the way back), my large duffle and bike made it to the plane. I didn’t stay long enough to see just how roughly the bike was handled, but I have a lot of confidence that it’s with me here! 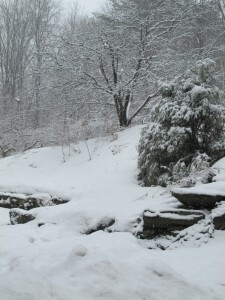 Snowfall on our first day of spring. 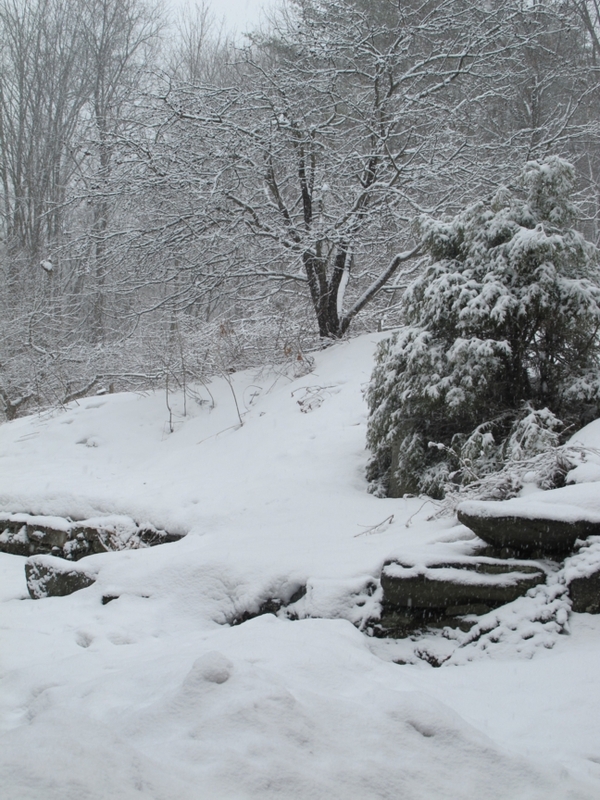 Lots of old snow still on the ground in our backyard. Click on photo to enlarge. It’s springtime in Vermont! Sort-of. This past weekend I was pruning apple trees with only a light jacket, basking in the warm sun. 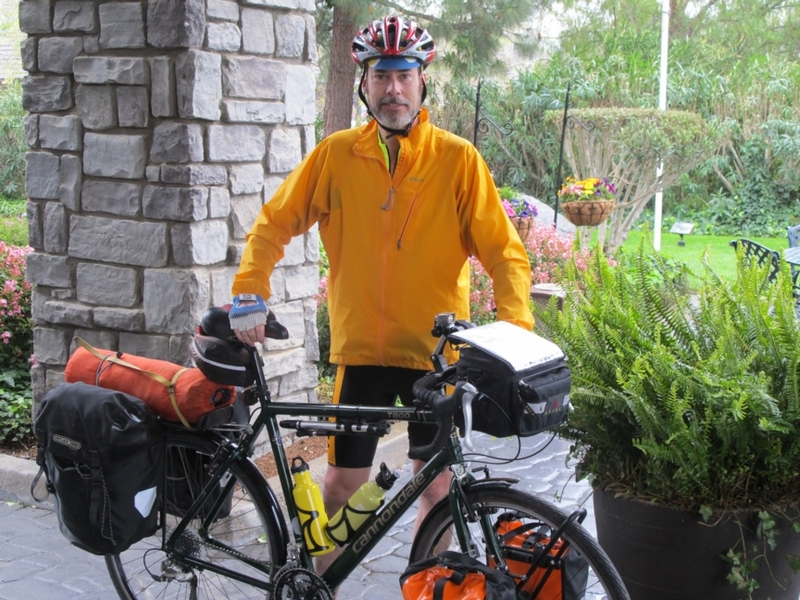 Today, it’s snowing—helping push me out the door…to San Diego and my Southwestern bicycle trip. It’s been a long winter here—a great winter for those of us who like snowshoeing and cross-country (or downhill) skiing. But today’s the first full day of spring. I understand that crocuses have been spotted in the area. I’ve been enjoying leaving off my high rubber boots as I take the compost out to our compost bin. I’m ready for spring. On Wednesday, I’ll leave the white behind and fly to San Diego to begin my adventures.